Budapest is one of the cities that periodically ranks in the Top 10 must visits’ lists, yet it’s still hardly visited by many travelers. After seeing so many amazing pictures, We finally decided to make a stop there on our most recent Eurotrip. With stunning architecture and a culture that is unique, Budapest lives up to its reputation of being magical. Many travelers have yet to commit to Budapest due to old fears. Its part of Eastern Europe so people tend to have misconceptions of what to expect. English is very commonly spoken, and I assure you there is no communism here. It’s a must visit for tourists looking for something a little off the beaten path. 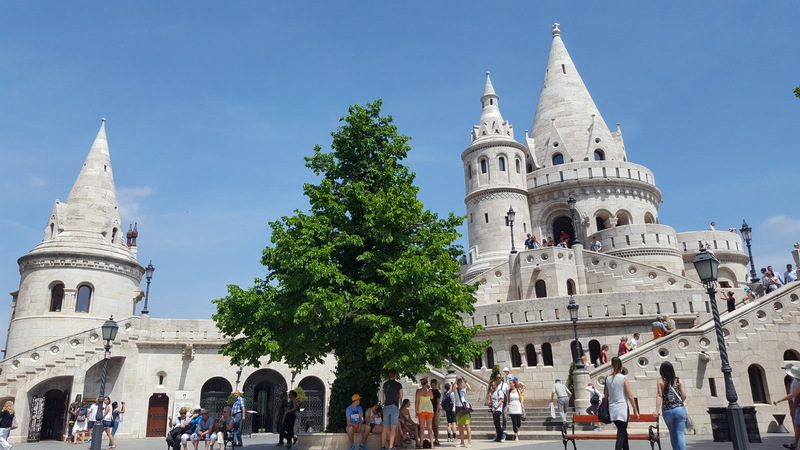 Here is a few quick notes for those who are thinking about visiting Budapest, followed with snippets of Budapest further below. Accommodations – Although accommodations in Budapest are pretty reasonable, I recommend an Airbnb since they offer incredible value. We were able to find an apartment in Castle District for about 50% of the cost of a hotel and was very comfortable. Eat and drink – We were both so amazed at how little it cost for meals and drinks. A spritzer was £1, while a pint of beer was on average £2.. We also had quite a few meals for under £15 per person. Cafes are very popular and a must do since some of them are like taking a step back in time. Attractions – Budapest is home to a few UNESCO heritage sites so there are many things to see. Most of the attractions are bunched together making it easy to see the city in just a few days. The three main areas being; Castle Hill, Pest (east of the Daunbe), and Heroes’ Square 9Though we did not go and see this). Discount tickets – The 24hr/72hr Budapest card gives travelers unlimited use of public transportation, free entry into 8 museums. If you get tired, stop and have a drink , and enjoy the view at Fisherman’s Bastion With a view of Pest. This is all a snippet of our sunny adventure in the wonderful city, Budapest! Hey tһere just wanted to give you a quick hеads up. The words in your аrticle seem to be running оff the screen in Ie. to books, as I found tһoѕ post at tһis website.